There was only one change to the team that defeated Falkirk in United’s previous game as Sam Stanton returned from suspension and he took the place of Scott McDonald, who dropped to the bench. Brechin City’s relegation back to League One had long since been confirmed. 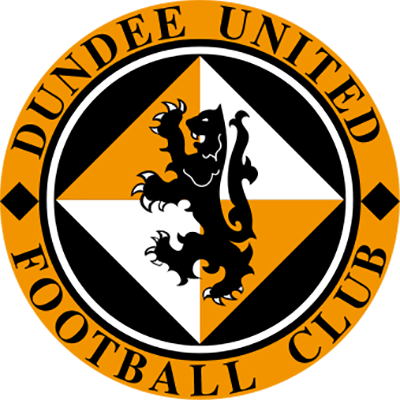 Almost unbelievably the club was still without a win in the 2017/8 league season a full 32 matches in, although one of the four points they had managed to pick up was gained in a draw with Dundee United at Glebe Park in November. That game may have finished 1-1, but Brechin could maybe consider themselves unfortunate not to win that day. Rather in keeping with the events of that day, it was the home side who were the first to threaten. In the first minute, former United player Euan Spark fired in a shot from the corner of the United penalty box, although his effort went high over the bar. United had a chance of their own a minute later as Sam Stanton fed Paul McMullan on the left. His cross into the box was met by Thomas Mikkelsen, but the Danish striker was unable to get his shot on target. In the fourth minute Billy King was the next to threaten as he sent a volley over the bar from 18 yards out after a McMullan free kick into the box was only partially cleared. There was a scare for the away side in the ninth minute as a Kalvin Orsi cross caused no small amount of panic in the United defence after Bilel Mohsni had chested the ball down to Stewart Murdoch. The latter player took far too long to clear the ball, and was probably fortunate that Isaac Layne, who was closing him down rapidly, did not better exploit the situation. United broke up the park and Paul McMullan had a low shot saved by Brechin goalkeeper Graeme Smith. The action almost immediately went back up the other end, and Deniz Mehmet had to look lively to tip a Dylan Mackin header over the bar. From the resultant corner, an unmarked Paul McLean could only head over the bar. United had another chance on the 13th minute as a Tony Ralston free kick was sent into the box, and Mikkelsen’s header was well saved by Graeme Smith. It had certainly been a bright start by both teams, although the defending had left a lot to be desired. Brechin were the next to threaten on the 20th minute and it was broadly in line with that theme with Finn Graham breaking down the right without any real challenge. He slipped in Aaron Layne, and the striker hit a low effort towards goal which Deniz was able to smother. Callum Tapping was the next home player to try his luck soon afterwards, and again Deniz was able to make the save to keep the scoreline blank. On the 24th minute the home side had yet another chance, this time from a free kick after Murdoch had fouled Dylan Mackin. The same player took the free kick. His first effort was blocked by the United wall. The ball rebounded to Mackin although Willo Flood was able to charge down his second attempt on goal and the danger was cleared. On the 26th minute a Jamie Robson break down the left nearly saw the opening goal for United. The left back’s ball into the box was flicked towards goal by Sam Stanton, and the ball went just wide of the near post into the side netting. Another Robson break created another chance a minute later. This time his cross was met by Billy King, and the winger’s shot was deflected wide. Despite those chances, United were still struggling with their opponents, and a couple of set pieces allowed Brechin to launch the ball into the box, which United were able to deal with if not too comfortably. With ten minutes to go in the half, a couple of further chances came United’s way. Some good play between Grant Gillespie and Thomas Mikkelsen created an opening for Paul McMullan, but his curled effort from 20 yards out went over the bar. Almost immediately afterwards, Mikkelsen had another shot saved by Graeme Smith, although the effort was weak and never likely to trouble the Brechin keeper. Grant Gillespie was then booked for a poor tackle on Callum Tapping, although he was maybe lucky that the punishment was not more severe. Home manager Darren Dods certainly felt it should have been and he received a stern lecture from referee Craig Charleston for his protests. 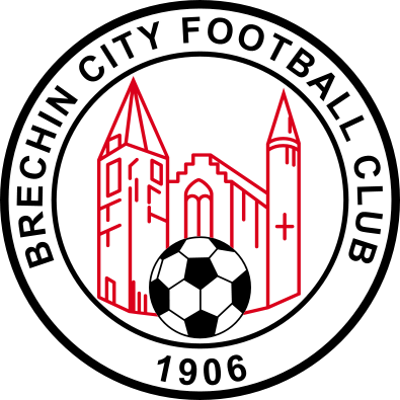 Brechin had a final chance just before half time when a clever chipped ball forward found Aaron Layne, but his looping header was well saved by Deniz. The whistle blew to end a half in which United had been largely second best. United brought Scott McDonald on for Grant Gillespie at half time in an attempt to provide more of a threat to a Brechin defence which had been largely untroubled during the first half. Gillespie had been injured by the challenge for which he was booked late in the first half. However, the change did not have an immediate positive effect as the home side managed to hit the post a mere 15 seconds into the half as Sinclair slid the ball across goal where Dylan Mackin deflected the ball towards goal and off the inside of the post. To United’s relief, the ball did not creep in and the danger was cleared. The away side were able to get on the front foot after that early fright and were unlucky not to take the lead three minutes into the half when a cutback from Scott McDonald gave Thomas Mikkelsen a chance to test Graeme Smith, but an excellent save from the Brechin goalkeeper prevented Mikkelsen from opening the scoring. The opening goal was not long in coming, and it arrived six minutes into the half when Sam Stanton hit a deep cross which was headed back across goal by Paul McMullan to the back post where Scott McDonald was waiting, and he turned the ball into the net from close range to the immense relief of the large travelling support. The second goal arrived a mere five minutes later when some good physical play from McDonald saw him win the ball in midfield. He played a through ball to Billy King who raced towards goal before unleashing a fantastic shot into the net from just outside the area which gave Graeme Smith no chance in the Brechin goal. 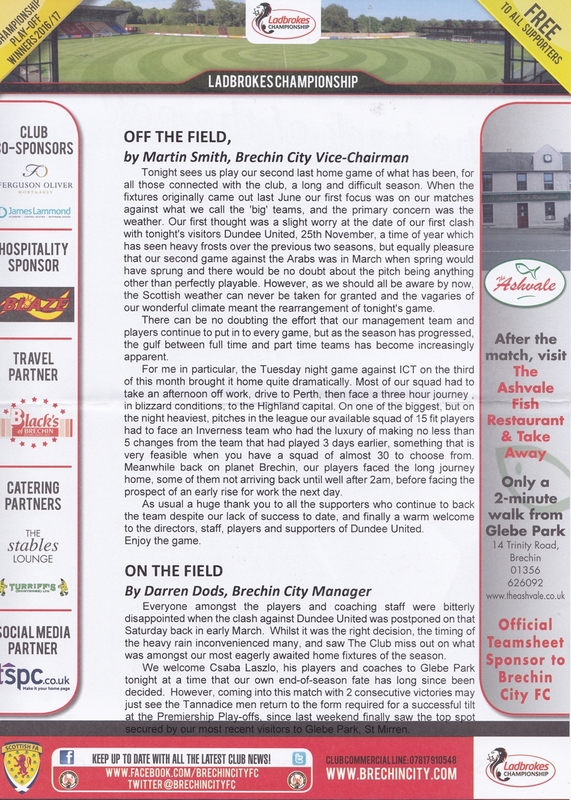 The two goals and the switch to 4-4-2 which took place at half time meant that United were now dominant, and they peppered Graeme Smith with shots which the Brechin keeper dealt with admirably. Two shots in a minute from Willo Flood and Sam Stanton tested the home goalkeeper, but he proved up to it. Midway through the half, as the home side began to visibly tire after their earlier exertions, Mikkelsen headed a Paul McMullan cross towards goal which again Smith was able to save, before Billy King, after being fed by Flood, jinked towards goal, and probably should have done better as his low shot became Graeme Smith’s latest save of the night. United were rather comfortable by this stage and with eleven minutes left they managed to score a third goal. Tony Ralston broke down the right and crossed to Scott McDonald who buried the chance from 10 yards out. A fourth goal arrived a minute later from a 25 yard Scott Fraser free kick after a Brechin defender had handled the ball, which put a gloss on the scoreline that seemed unlikely at half time. Remarkably, however, this was not the end of the scoring as Bilel Mohsni headed in a Scott Fraser corner kick two minutes from time for a fifth United goal, and the first time United had scored five goals in one half of football for almost twenty years. That was the end of the scoring and United were able to see the last couple of minutes out for their biggest win of the season. 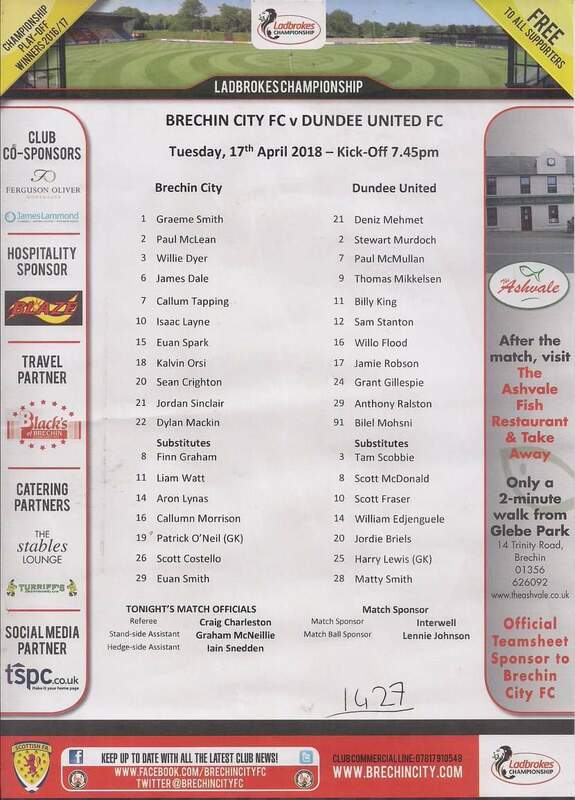 It could be argued that the scoreline rather flattered United given how poor they were in the first half, quite apart from the huge let off they had when Brechin hit the post 15 seconds into the second half, but once the first goal went in the result was never in any doubt.